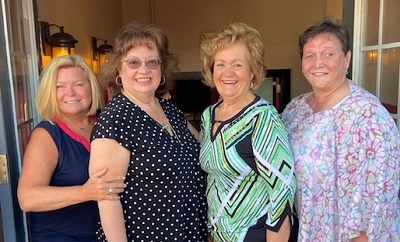 The Knights of Columbus Ladies of Council 11372 formed in 1994, the same year the Council was instituted. The Ladies follow the lead of the Knights in working to serve Church, Community, Youth, Council, and Family. Plus, we also manage to have a lot of fun working together and have and continue to make lasting friendships! As with any group, new members are needed to sustain the group and the activities. Here are some FAQs on membership in the K of C Ladies! Membership is open to all ladies 18 years of age and older who are parishioners of St. Francis de Sales – regardless of whether your husband is a Knight or not. Dues of $1 per month are paid annually in July. Each year, four Officers are elected: President, Vice-President, Treasurer, and Secretary. We install new officers in June at our Installation Dinner – usually at a local restaurant. It’s a lovely event and a dinner out with the girls! We meet once a month – on the 3rd Monday at 7:30 p.m. in the Knights Hall at St. Francis de Sales. Typically, the meeting runs about an hour. We normally join the Knights in Kilduff Hall after the meeting for a social gathering, where food and beverages are served. At our meetings, we discuss upcoming projects and activities, many times welcoming an outside group to come in talk with us. Committees are formed to work on various events, and all Ladies are asked to support the activities as best they can. What do the Ladies do? We strive to support several groups with proceeds from our various fundraisers. Here at St. Francis, we regularly support the Youth Group, St. Francis Outreach, the Church, our sister parish in Haiti, Scouts, etc. We are also supportive of groups within our community, such as Birth Right and Anna’s House, as well as around the world by way of donations to Smile Train, and Marshall Islands interns. From shoeboxes filled with items for our troops overseas, to Easter gifts for local nursing homes, to Christmas gifts for needy families, our projects come from the heart. To support many of our projects, we have several fundraisers throughout the year. Other fundraisers in years past have included Longaberger Basket Bingo, Dinner Bingo, Wine & Beer Tasting, Jewelry Shows and Events. We’re also known for our delicious baked goods, and we usually hold at least one bake sale each year. If you have any questions, contact our President, Cynthia Santiago, at ladies@kofc11372.org for more information. Feel good about yourself – Be a Lady!